The story is set almost entirely in the fictional town of Castle Rock, Maine. The action centers on Cujo, a St. Bernard that belongs to Joe Camber and his family. Although Camber is somewhat fond of Cujo, he never bothers to get the dog vaccinated against rabies. While chasing a rabbit in the fields around the Cambers' house, Cujo gets his head temporarily stuck in the entrance to a small limestone cave and is bitten on the nose by a bat and infected with rabies. Cujo - a huge but generally gentle and friendly dog - get's infected with rabies and turns into a deadly beast, killing everyone in it's path. "Cujo knew he was too old to chase rabbits." "It would perhaps not be amiss to point out that he had always tried to be a good dog. He had tried to do all the things his MAN and his WOMAN, and most of all his BOY, had asked or expected of him. He would have died for them, if that had been required. He had never wanted to kill anybody. He had been struck by something, possibly destiny, or fate, or only a degenerative nerve disease called rabies. Free will was not a factor." "Cujo" was one of these novellas I tried to stay away from as long as possible. I don't really know why exactly, but I wasn't very fond of the idea of a rabid dog on a killing spree.. I love dogs and perhaps that's why I was keeping away from this particular book. However, being a huge SK fan, I just couldn't walk away from this book when I saw it on the library shelf the other day. And you know what, it was a great decision to get it! 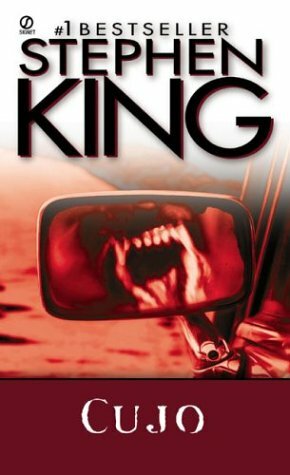 I was pleasantly surprised, as King didn't make a mindless, stupid beast out of Cujo, but a smart, loving, gentle giant, who happened to be in the wrong place at the wrong time.. I loved the way the book unravels, showing the story from few different perspectives (especially Cujo's perspective was oh so brilliant and tragic!). It amazes me that this book was written few years before I was even born, yet I can relate to the characters in the story. And of course, King's writing style is delicious as always, which makes me think maybe I should reach for Firestarter - another SK book I've been subconsciously staying away from. Haven't seen it myself yet, but definitely will soon! I loved this book, especially from the dog's POV. I love King's books and this book is awesome because the dog isn't mindless. I haven't read the book, but i've seen the movie. The movie was good. Stephen King classic! My friend loves him a lot. I'd like to read more of his books. So far I've read only about four. No way! I am a scardy cat when it comes to King books. Anyone who reads this one will have a fear of dogs for a while. Thanks for your review. Thanks for the review. I find it hard to read any of King's books, though I've read a few. If I find the book in the library I'll probably read it but it takes me surprisingly long time to read his books even though they're great! I don't think I'd be able to handle this book at all, so I probably won't read it, but it does sound intriguing, and I'm glad you enjoyed reading it. Maybe in a few years, if I can handle a book like this (I love mystery, and I'm glad Cujo isn't a mindless killing machine, but it still sounds a little beyond me, if that makes any sense), I'll give it a shot. Thanks for the review! I had the chance to read this last year. My excuse for staying away? A relative's marriage had just gone belly-up and I thought that the affair the mother was having would rub me too raw at the time. That may sound like a strange thing to say about a "Horror" novel, but I've found that Stephen King's characters are so amazingly real. And now you assure us that even his dog character is brilliantly and tragically real! Oh, I'll believe it! What I'd really like to read this year is It, but I'd love to get to Cujo sooner rather than later. I can't believe I've never read this. I know it would scare me silly. I love me some Stephen King! And this one is flippin spoooookky!! Gotta love a book that makes you sleep with a night light on for at least 2 weeks. Maybe 3 1/2. Thanks for your review! poor Cujo, it breaks my heart to read a story about lovely animal become a monster, I don't know if I can stand to read this one.